After the Revolutionary War, a number of loyalists who still wanted to remain under British rule fled the United States for Canada. Richard Beasley was among them and, for a time, prospered. He built a brick home in what was called Burlington Heights which he was later forced to sell due to financial difficulties. The property was purchased by Sir Allan Napier MacNab (an ancestor of Camilla Parker-Bowles) who, over the course of three years, built Dundurn Castle on the foundations of Beasley's brick home. 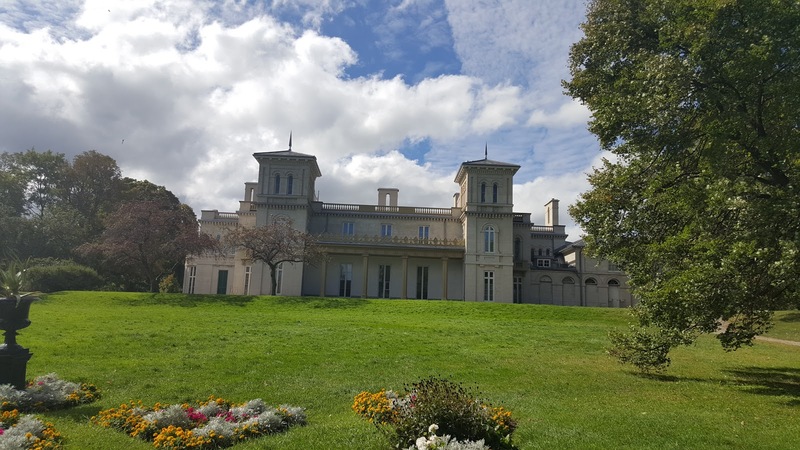 Once built, Dundurn Castle became famous all over Canada for its grand entertainments and its modern technology such as gas lighting and running water. Today, Dundurn Castle is owned by the city of Hamilton and is open to the public. I visited the site this afternoon and found that its distinguishing feature, its towering columns, which are a focal point for newlywed couples to have professional pictures taken of themselves on their wedding day, were under repair. That may mar the outside appearance, but, the rest of the property is still in great shape and it all looks beautiful. I walked along the grounds and took a guided tour of the mansion. There were a number of people walking around in period clothing fulfilling the various functions of the house, but they don't act as if they are living in the time period. There's also a military museum on the grounds that has a lot of information about the War of 1812 from the Canadian perspective. I didn't spend much time there, but I was interested to learn about the battles that occurred in that area during that time.